4.1 out of 5 based on 102 bloggers and 68 commenters. 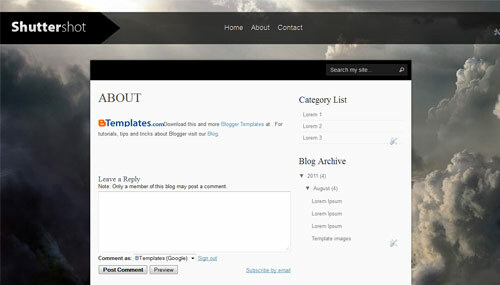 Shutter Shot is a free blogger template adapted from WordPress with 1 column and slider. Cara!!! Parabens pelo Template esse ficou Show de bola. I would like to use your template and edit few elements in it. I will leave the copyright thing there uneditted. could you reupload it. thanks. possible to add in paging for content ? How do I remove or change the shutter shot logo? @Joseph Lim: already fixed. just ignore. thanks. Please how did you change the shuttershot logo? @Quintus: Please login to blogger account > Blogger Dashboard > Design Tab > Edit Html Tab. and then you are able to change logo image. It is a great theme ever. I want the bottomhead link (label at the bottom) to be appeared at the centre. How can I do it? and also, the homepage – the bottom black shadow that runs across the botom, how do i add maybe a FB logo or twitter icon in the black strip – or even delete the strip all together? Great template and cannot wait to implement it. Thanks! and where the columns is changed, sorry for the abuse. I’m new to these issues. and expand the submenus more ..
@Agung Anugerah: How did you get the posts to show? I cannot figure that out. @Mike you need to tag each of your post with the same label. @Joseph Lim Thank you. Looking at your blog, how did you get your posts to post on a different page other than your main page? @Mike: do you mean those pages on the top bar ? the lower bar are based on label associated post. the top bar are actually pages. b) How can I change the lower bar to be direct links to the entries and not labels? c) Why the preview of the entry just cut the text in a random spot? can I change that? ola parabéns pelos templantes,eu coloquei este template mas não consigo ver as postagem nele,o que eu devo fase?? @anyone, downloaded this template. Absolutely awesome, but as a programming noob, I haven’t figured out how to add the “about” and “contact” portions to this template. Please help with some step by steps. thx. I looked at your image but I am not quite sure what exactly you are wanting to do. Could you provide a bit more information? b) See above…but a quick note. Each blog post you publish technically has it’s own dedicated page. So when you publish a post go to that dedicated page and copy that URL and insert it into the code as explained above. c) Could you give an example or screenshot? Also, I don’t mean to sound rude at all but, please read what you write before you click “Submit comment.” This will help with any issues you may have in the future. Eu criei uma página de blog e utilizado um rótulo específico por post. Espero que ajude! Does anyone know what the native resolution is for the slideshow images? I linked some of my photos from photobucket and they look horrible and seem to be getting cropped at the top and bottom. For the best web view and practices, keep your images at 75dpi. Usually, when I make a wallpaper, I create it at 1600×1200 with a 75dpi. That way, scince most people’s resolutions are that size or smaller, the wallpaper comes out looking good. It’s better to shrink it than stretch it. Como colocar link onde está LOREM 1 LOREM 2 LOREM 3? Não estou conseguindo! @Agung Anugerah: To add post label just follow given below instruction. Login to Blogger Dashboard > Go to New Post / Edit Post Tab > and you are able to put label. @Agung Anugerah: You need to watch instruction video at Best Theme. @Arvin: You need to find below code. then you need to put you code below <p><data:post.body/></p> . Hi, this is one of the most beatiful templates I´ve ever seen. Thanks for it. Could you tell me how can I add a “Read more” button? Hello. I have made a page and the layout is solid white, preventing the beautiful slideshow background of the template to be seen. How can I make the page layout transparent? hello again everyone. does anyone know how to change the font and/or size of the font on each page title? I wanted to remove the page title altogether but blogger wont allow it. So i figured maybe i could reformat to something nicer and smaller. thanks in advance for any help you guys can provide. ^^^regarding my last post, just in case the question is confusing, I meant the title font within the new page which shows the name of your blog, not the titles such as “home” “about” etc. hello again. I figured out how to edit page text but now I am a finding that my background images won’t load in internet explorer. I typically work in firefox so I hadn’t bothered to check until today. I am formatting my images as (.png) just like the original images. Any suggestions out there? tengo una duda ,cuando abro la web me sale todo bien pero deseo q en la mitad de de la pagina principal donde solamente salen las fotos poner un flash .como lo hago¿? Just a quick question, how do I change the favicon? I tried going to Design > Page Elements and I’ve changed the orange blogger symbol to my own icon, but it wont show on my blog. Stream but no luck. Any suggestiong? 1.I’m with Alen (previous post)… How do I remove the ShuttorShot Logo using wordpress. I also could not find (http://4.bp.blogspot.com/-gClKIGM3V3k/TkBQBl1wz6I/AAAAAAAAAyc/53wLGr83TDM/s000/logo.png) when I went to my dashboard > editor. How do I remove this? 2. On my welcome page, is it possible to just have the images in the background rather than a blog, template, or full page? I want visitors to come to my site and see the background slides in full view before clicking on the links. And why; I have many “gadget” in my manager gadget? If I modify a code to a correction of element; the .xml broken. Any here; know : how modify the height page? Sorry, can’t edit files with “..” in the name. If you are trying to edit a file in your WordPress home directory, you can just type the name of the file in. What do you suggest? Thank you! @carly: Also, how do I direct my posts to show on a specific page? I went to “Settings” “Reading” and changed my “posts page” there, but my posts are not showing up on the actual page. Thanks! I am using this theme but I would really like the slider to go a bit slower. Anyone knows how to fix that?